Since 2015, Natusha Croes has been focusing on creating projects ingeniously combining unconventional music production, performance, poetry and storytelling through the interaction with inanimate objects found in her environment. 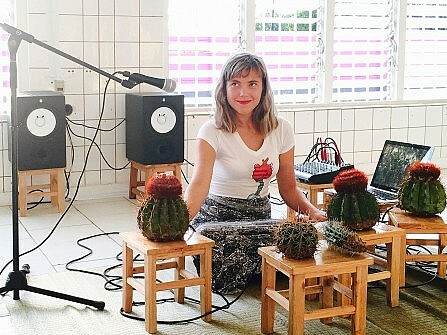 Natusha Croes creates music compositions with a visual affinity; manipulating the sound of organic pieces through digital means such as loop machines and music production softwares. 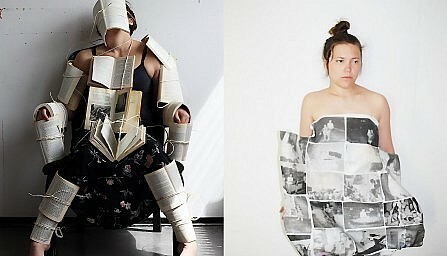 This will act as the leading base for her explorative performances connecting the performer (body), object and sound. My desire is to search for objects that will bring a balance in between the acoustic realm of the space while visually unfolding the body’s relationship with the recruited objects; transmuting their value by creating a situation where the performer has the liberty to transform their normal use to the sole use of activating an installation sonically and visually. Born in 1991 in Oranjestad, Aruba, Natusha Croes is a member of a family of musicians. After participating in many cultural events as a child growing up, she quickly gained a curiosity for other forms of expression and gradually developed her practice in the field of visual arts. She went on to study at Gerrit Rietveld Academy, the Netherlands, in the department of audio visual arts, as well as at Ateliers ‘89, Aruba. Having returned back to Aruba, Croes participated in a number of exhibitions, conceptualized creative events as well as performed in different music venues in order to bring forward the practice of performance in contemporary art. During her residency at SomoS, the artist aims to form a new performative identity that could help her develop new narratives surrounding her newfound fascination with ready-made instruments.